At the fall of Fascismus, some political, military and administrative departments which had been directly controlled by the party, were dissolved or abandoned. R.S.I. was therefore, beginning a new great reorganization of such structures. The Republican National Guard, born from the necessity to combine the tasks entrusted to the military police (the Carabinieri remained in fact loyal to the Monarchy), with those of the party's police in order to safeguard the new republican state. The G.N.R. was made up of the fusion of the arm of Carabinieri with Police of Italian Africa (P.A.I.) and the old Voluntary Militia for National Security (M.V.S.N. ), was under Gen. Renato Ricci's command, who decreed the overprinting of the stamps that had been lying at the post offices of Brescia ,with the inscriptions G.N.R, in order to celebrate the constitution of the new police. For this purpose some typographical proofs composition with several kinds of characters were created at the Austoni & Bontacchio printing office in Brescia ( in the beginning another more organized printing office was chosen, which was later censured because it had been regarded as not loyal to the republican regime ). After that the characters and the press compositions had been decided, the overprinting works started on December 17, 1943. In the beginning only single sheets of 100 stamp coming from the Central post office Brescia were overprinted, subsequently double sheets coming from Milan were overprinted too. These constituted the great part of the issue. Already on December 20, 1943, some stamps from Imperial set ( issued on 1929 ), overprinted, were available at Brescia central post office and, later, at all other post offices of region. All this was realized without the post authorities's knowing,who ordered to suspend the printings, because they didn't know that the authorization of the issue of such stamps had come by the Mussolini himself, who seemed to have chosen the types of characters to use. Therefore, in order to avoid a crash with Mussolini, the Comunication Minister reversed his decision and approved a second and more extensive issue of overprinted stamps, this was one also to avoid philatelic speculations, because the overprinted stamps ( particularly the values with higher facial price ), were in great demand among collectors already on 1944, the caalogues of that time reported a very high quotation of the overprinted sets. The Chiamenti printing office in Verona ( This place was choosen because the Comunication Minister was located in this city ), was in charge of such new issue more copious. This factory organized the press, imitating the types of Brescia, but using zinc slabs instead movable characters used at Brescia and, for this reason, the issue of Verona was more modest among the overprinting varieties that had enriched the one from Brescia. Verona cliches adopted types similar to character Raffaello ( this is the name of I° type characters used at Brescia ) but, an expert's report can point out the differences between Verona and Brescia issues. Also on this occasion the collectors caused a chase for the most valuable stamps, such that some items did not reach the post offices and were bought up by collectors, speculators and philatelists. These are the main reasons that contribute to render the issues of the G.N.R. the most valuable of the Italian philately. Unfortunately for political reasons, and because of the elevated numbers of forgeries and counterfeits stamps, the collecting of the GNR stamps does not meet with the success it would deserve. 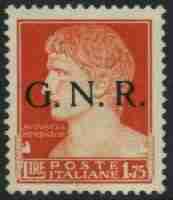 Above is showed GNR set overprinted in Brescia. Below are the quantity issues, all proofs are included in that quantity, also "spaced overprints", typicals of Lupa format (horizontal size ). The stamps of this set regularly sold, have (*). We remember that Brescia overprint was made by movable types. I don't want to define the differences between II° and III° type characters of Brescia overprint and all typographical compositions used because it is a very specialized argument, but I can give all informations about this to all interested collectors. The issue of Verona, rareless than Brescia, was itself subject to speculations too. The overprint was made by zinc slabs with types that copied Brescia I° type characters. It was a counterfeit of Brescia issue. This set was issue from January to May 1944. The symbol (*) identify the stamps regularly sold at Post offices. Below are the knowed quantity issued.